Superyacht industry leaders gathered at the Yacht Club de Monaco last week to share their views on the market in 2011, and how to improve its health in the future. The fourth Symposium Economique la Belle Classe began with short introductory speeches by David Legrand, a sales broker at Fraser Yachts and Olivier Blanchet, a fund manager for yachts BNP Paribas, after which guests exchanged their views informally over dinner. Themes that emerged included the need to offer clients an integrated approach from shipyard to delivery; how to work with international maritime regulations and taxes; and competition from countries such as China and Turkey. In terms of new build, the consensus was that shipyards with strong international reputations, and which build yachts over 70m, were faring better than their lesser-known and smaller counterparts. This may be due to the fact that a shipyard’s reputation affects the resale value of its yachts, and owners are now more conscious of how much they will eventually recoup on this asset. ‘Europe, which boasts real expertise, is still leader of the customised sector with a recovery noted in the US market for +70m,’ said yacht designer Espen Oeino. Conversely, Burger Boat in the US reported a drop in demand for yachts under 40m, perhaps because there are so many available in the second-hand market, especially 24-30m. Indeed, perhaps also for this reason, in the re-sale market brokers reported prices had fallen 30 to 40 per cent. Experiences in 2011 also helped the industry better understand emerging and young markets. Tony Allen, a maritime lawyer from London firm Hill Dickinson, believes Russians are buying, but the profile of these owners is changing. ‘The real change in this sector is in the profile of the third generation of Russian owners. They are much younger with a drop in the average age of 10 to 12 years. They are looking more for new designs and a modern approach, rather than the traditional maritime culture,’ he said. In China, Amy Milner of Kingship, believes branding is particularly important, as the success of Lu?rssen and Azimut in that arena suggests. ‘Given the lack of a yachting culture, it’s all about branding. A yacht is a sign of social success,’ she says. The yachting industry has a significant economic impact on Monaco and the Provence Côte d’Azur region in general, where about 3,000 crewmembers are employed. 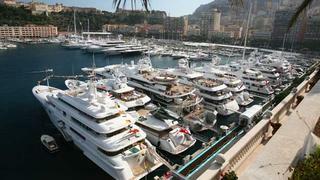 Apart from the yachting fraternity and bankers involved in the industry, those present included Monaco politicians H.E. Marco Piccinini, Minister of Finance and the Economy; Paul Masseron, Minister of the Interior; and Jean-François Robillon, President of the Conseil National.